Mr. Hamad Salem Al Ameri (right), CEO of Caracal International and Mr. Jung In (left) , CEO of DI Optical are signing the agreement at the Caracal booth (8C-01) in the "DX Korea 2016" exhibition. The recognized arms manufacturer Caracal International signed Memorandum of Understanding (MOU) with Dong In Optical (DI Optiacal), well known for its dedication to rifle sight solution on Sept. 7, 2016. The agreement was signed by Mr. Hamad Salem Al Ameri, CEO of Caracal International and Mr. Jung In, CEO of DI Optical at the Caracal booth (8C-01) in the "DX Korea 2016" exhibition. This agreement is to establish close technical cooperation between two manufacturers and is expected to bring mutual benefit and progress for both organizations, while sharing knowledge and experiences. “This MOU showcases our joint interest to create the opportunity to collaborate between two highly-experienced teams and provide quality integrated weapons and optics,” said Hamad Al Ameri, CEO of Caracal International. 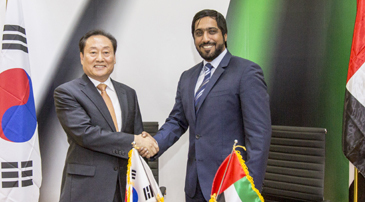 “As a Korean Leading Dot Sight Manufacturer, we are very pleased to sign the MOU with Caracal International, a leading small arms manufacturer in the UAE as an Abu Dhabi government body. It will be also significant for both Korean and Abu Dhabi government that have been seeking intergovernmental industrial cooperation,” said Jung In, CEO of DI Optical, looking forward to achieving mutually beneficial business success sooner, as a result of the collaborative relationship. Caracal International, producer of a full range of pistols, tactical sniper rifles, hunting rifles, and tactical rifles, and more than 220 other arms manufacturers from all over the world, as well as top military brass from 35 countries, are participating in "DX Korea 2016." Hosted by the Association of the Republic of Korea Army, the fair is held at the Korea International Exhibition Center (KINTEX), northwest of Seoul, from Sept. 7 to Sept. 10, 2016.